Want to make some money in San Francisco? Maybe even save a little for the future? We thought so — especially because it’s notorious for being one of the most expensive cities to live in the U.S.
We’ve compiled a tons of ways you can boost your bottom line — most of them you can do from the comfort of your couch. Fun fact: California residents can earn money when they sync their utility accounts to an energy-sharing program called OhmConnect. Why is OhmConnect willing to pay you to do things like unplug your coffeemaker, turn the TV off and stop the dryer just one hour a day (called an #OhmHour)? #OhmHours occur when the energy grid is overworking and must rely on dirty power plants to prevent a brownout. #OhmHours typically occur once or twice a week in the afternoons or evenings. The more electricity you save, the more you could earn. Take notes from John Hastie, who has been able to make more than $400 in one month with OhmConnect. 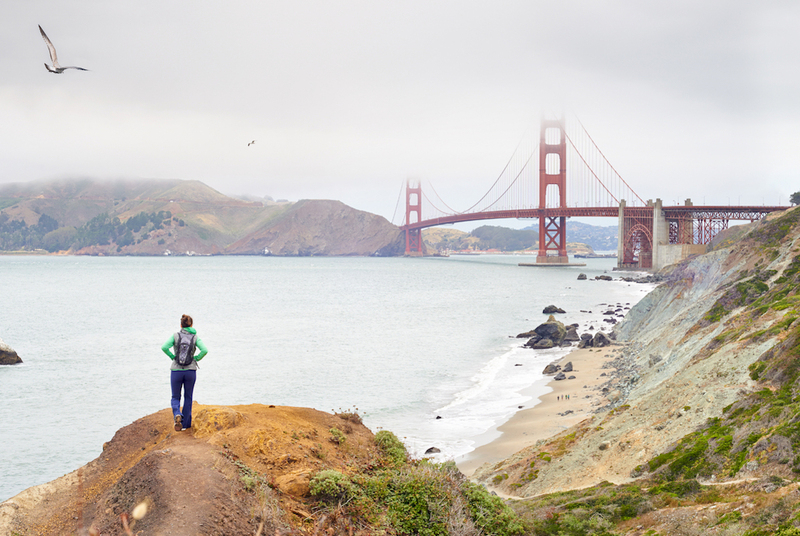 WalletHub named San Francisco one of the healthiest cities in America. If you don’t feel like you fit into that category (yikes, pun not intended), that’s OK. There’s good news for you. You could get paid to lose weight. Here’s how: Sign up for HealthyWage. Define a goal weight and a timeframe within which you plan to achieve it. Place a bet on yourself, between $20 to $500 a month. HealthyWage’s calculator will consider how much weight you have to lose, how much time you give yourself to do it and how much money you’re willing to put on the line. This will determine your reward — which could be up to $10,000. OK, we say invest in San Francisco real estate, and you think maybe you could afford to invest in a patch of grass. Or maybe half a parking space. Think again. You can start investing in real estate with as little as $500 — without leaving your couch. Fundrise, a real estate investing platform, allows you to invest with its Fundrise Starter Portfolio. There, your money will be split into two portfolios that support private real estate around the United States. You aren’t just funneling your money off to some faraway land, either. You can see exactly which properties are included in your portfolios — like a set of townhomes in Snoqualmie, Washington, or an apartment building in Charlotte, North Carolina. Have a spare room? Couch? Might as well try to earn some money by listing it on Airbnb. And there’s no reason you can’t be creative. We found a guy in Mountain, View, California, who earns $1,380 a month listing a backyard tent on Airbnb. Check with the California’s State Controller site to see if you have anything coming.. If you own a reliable vehicle — but leave it sitting in your driveway all the time — you could turn it into an income stream by renting it. Have a bunch of movies or CDs collecting dust on a shelf? Clear some space to help you breathe, and put that old stuff to work for you. Decluttr will pay you for these items — plus your Blu-rays, video games and other electronics like cell phones, tablets, game consoles and iPods. For virtually anything, you can also use Letgo. This intuitive app lets you snap a photo and upload your item in less than 30 seconds. Not only does it remove a lot of the hassle of selling things online, it’s also 100% free to use. Seriously, it’s time to let “Jagged Little Pill” go. Or at least sign up for Spotify. Before you head to the store (or start shopping online), search for items on your shopping list within the app. Strawberries? Check. An ear of corn? Check. Cash back on a hotel room? Check. Add each cash-back opportunity to your list in the app. Surveys aren’t our favorite way to make money, but if you’re just vegging out on the couch, why not click a couple buttons and earn a few bucks? InboxDollars offers several short, daily surveys, and you’ll get a $5 bonus for signing up. Plus, you get to earn cash, so you don’t have to worry about exchanging points. Check out how one college student pocketed $600 with InboxDollars. Her secret? Persistence. Opinion Outpost: What sets this apart from other survey sites is it gives away $40,000 every year. It has a quarterly drawing for a $10,000 cash prize — and for every survey you complete, you’ll get one entry into the sweepstakes! If you have an extra parking space in the city, you might be able to establish a stream of passive income. Look for online platforms that allow you to list your space. Craigslist seems to be a popular one. It boasts more than 1,000 parking and storage listings in the area. A two-car garage with a remote and keypad is going for $499 a month in the Mission District. Not bad for a slab of asphalt, right? Here’s an option we like: It’s the Chase Freedom Unlimited card. Its claim to fame? You’ll earn an unlimited 1.5% cash back on all your purchases. Plus, if you spend $500 in your first three months of opening the card (hi, BART fare), you’ll pocket a $150 bonus. You don’t have to wear a giant banana get-up or know any fancy sign-spinning tricks for this gig. Sign up to be a human billboard through Nomad Technologies, and you’ll walk around with a tablet displaying a branded message attached to your backpack. The CEO describes it as “Uber for advertising” in that brands can launch a campaign anywhere and folks can sign up to showcase it whenever they want. Nomads are paid $10 to $20 an hour. There’s even surge pricing, allowing you to get paid more. When you think of a matchmaker, you might think of a cartoon cupid character or even some type of genie in a bottle. The notion seems unreal — that someone could actually set you up with your soulmate. And, no, we’re not talking about Tinder. Tawkify employs a team of matchmakers across the U.S. to match love birds — and it’s always looking for new members to join, especially in one of its first cities, San Francisco. You don’t necessarily need a background in matchmaking. Team members have included lawyers, life coaches, entrepreneurs, teachers and even writers. Some matchmakers have made up to $50,000 a year working part time. The gig economy is saturated with ride-sharing services. Notice we haven’t mentioned any of the traditional ones? That’s because you probably already know about them. One you might not know about? HopSkipDrive, an online ride-service platform that helps parents schedule rides for their kids ages 6 and older. Yup — it’s like Uber, but for kids. So-called CareDrivers can make up to $30 an hour shuffling kids around, from school to practice to recitals. Right now, the service is recruiting CareDrivers in Los Angeles, Orange County and the Bay Area. Unfortunately, “passive income” doesn’t mean you can sit back and embrace the lazy. You’re going to have to work a little at first. If you want to fully understand the concept — and get some ideas churning — check out our guide to passive income. Setting up a form of passive income is important; it allows you a little more room for flexibility while still feeling financially secure. Carson Kohler ([email protected]) is a staff writer at The Penny Hoarder. She visited San Francisco last year and fell in love.